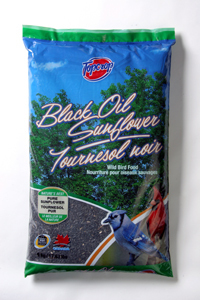 Topcrop brand Black Oil Sunflower is the ideal choice for attracting a full range of wild birds to your feeder. Oil sunflower is most preferred by birds than any other seed. This is a premium product so there is less waste at your feeder, plus you will attract more desirable birds, such as Blue Jays, Cardinals, Nuthatches, Chickadees, Grosbeaks, Tufted Titmouse, and American Goldfinch.